COWLEY COUNTY — Law enforcement authorities are investigating a fatal weekend crash and have identified the victims. Early Sunday morning a driver lost control of a vehicle traveling at a high rate of speed on Summit Street in Arkansas City, according to police. 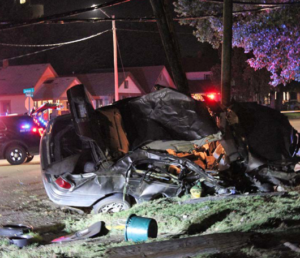 The vehicle hit utility poles and the driver and a passenger were both ejected. Kenneth Dale Wall, Jr., 49, Arkansas City died in the crash, according to Public Information Officer Andrew Lawson. Wall’s son Jacob Ryan Wall, 19, of Arkansas city was transported for treatment and is expected to make a full recovery, according to Lawson. Police have not determined who was driving at the time of the accident.